Michelle Desilets has been working alongside Lone Droscher Nielsen in orangutan conservation for over 15 years. In 1994, Michelle took her first trip to Borneo, as a volunteer-tourist at the Tanjung Puting National Park. In the years that followed, she continued to visit Borneo as a volunteer for as long as 4 months at a time. In 1997, Michelle and fellow volunteer Lone Droscher Nielsen left the organization with whom they were working, and sought the advice of Dr Willie Smits about the possibility of creating a new project in Central Kalimantan to deal with the swelling numbers of orphaned orangutans. Dr Smits agreed to help, and with the financial backing of the Gibbon Foundation and BOS Indonesia, the Nyaru Menteng Orangutan Reintroduction Project was born. It received its first dozen orangutans in 1999. Now the centre has over 600 orangutans in its care, and is regarded as perhaps the finest primate rehabilitation project in the world. Michelle founded the Borneo Orangutan Survival Foundation UK to support the work of Lone as well as the other activities of BOS in Indonesia. 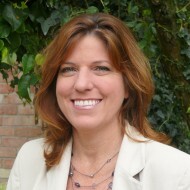 As Executive Director of BOS UK, Michelle initiated a number of international campaigns to help orangutans, such as campaigns to end the illegal trade of orangutans and to repatriate known smuggled orangutans, as well as the campaign for sustainable palm oil. 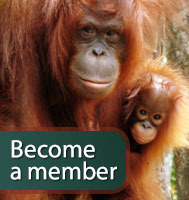 (She now sits on several working groups in the Roundtable for Sustainable Palm Oil.) In 2005, Michelle gave up her career in education to devote her efforts full time to these campaigns, as well as the never-ending search for the funds needed to continue the efforts in the field. She spends a good deal of time at the Nyaru Menteng project, and as such provides supporters with an inside look at what is happening with orangutan conservation on the front line. A true advocate for orangutan conservation, Michelle Desilets is known in conservation circles as a woman who will not give up in her efforts to save the orangutans.